I revel in colour. I love colour. 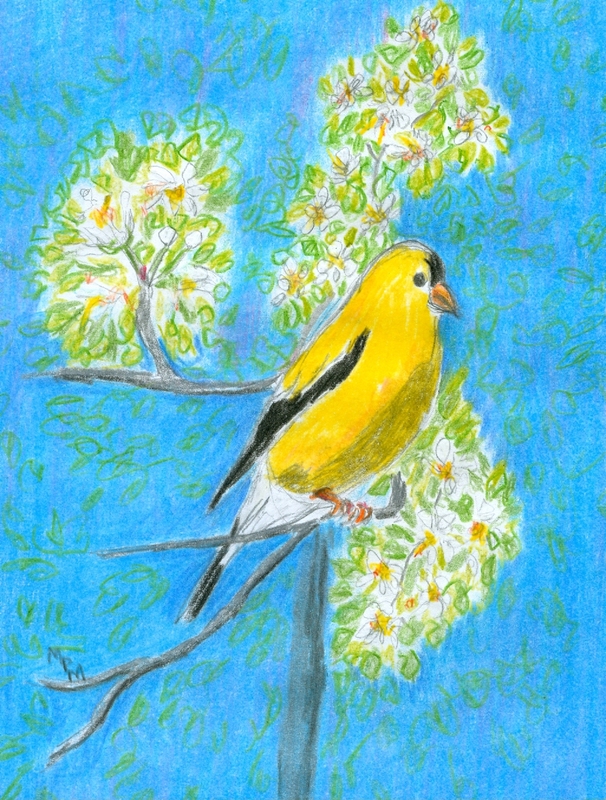 I enjoy painting and the natural world around me is a constant source of richness. If everything were black and white or just grey or even only one colour, I would find life very bland. Poor Midas who turned all he touched into gold. No more scarlet or azure or violet. What a sad world! I feast upon colours and I am a greedly little pig about it. I’m not a gardener of any sort, but I gorge upon the gardens of others. I even love the spring dandelions that most homeowners hate. My office is red because red is my very favourite colour, but I’m a fair opportunity employer when it comes to palettes. Bring on the rich purples, the opaline whites, the chocolate browns and robin’s egg blues. And that brings me to our feast of colour today. Birds. Lots of birds. Birds preening, birds flitting in and out of trees, birds nibbling at the bird feeders and birds strutting their colours. My husband and I had spent the morning at a nursing home where he led the service and we both took part in the choir. Our choir leader and other members had kindly consented to sing their hearts out for the seniors today. After a wonderful morning praising the Lord, my husband and I went on to the tire shop to change our car’s tires over from winter treads to summer. It just so happens that the tire shop is just a few seconds away from a delightful antiques shop/bed and breakfast/tea room. So off we went to enjoy a delicious two hour lunch with a picture window view of their lovely garden full of bird feeders and birds. We had the best seats in the house and while we feasted on cream of lovage soup, salad and quiche (me) and Montreal smoked meat sandwich (Bud,) we watched the passing parade of colourful feathered performers. While we munched, we observed spectacular rose-breasted grosbeaks, pretty house finches, sunny yellow goldfinches, robins, starlings, blue jays and shiny black/blue grackles. There was a mourning dove as well ,fluffing up his breast on the wrought iron fence. At one point six goldfinch, three males and three females, clung to six different perches of the feeder full of niger seed. It really was a feast for the eyes. We spent our whole meal exclaiming over the beauty of the birds. It was my pre-Mother’s Day treat and I ate up every scrap of my meal and my colour banquet. 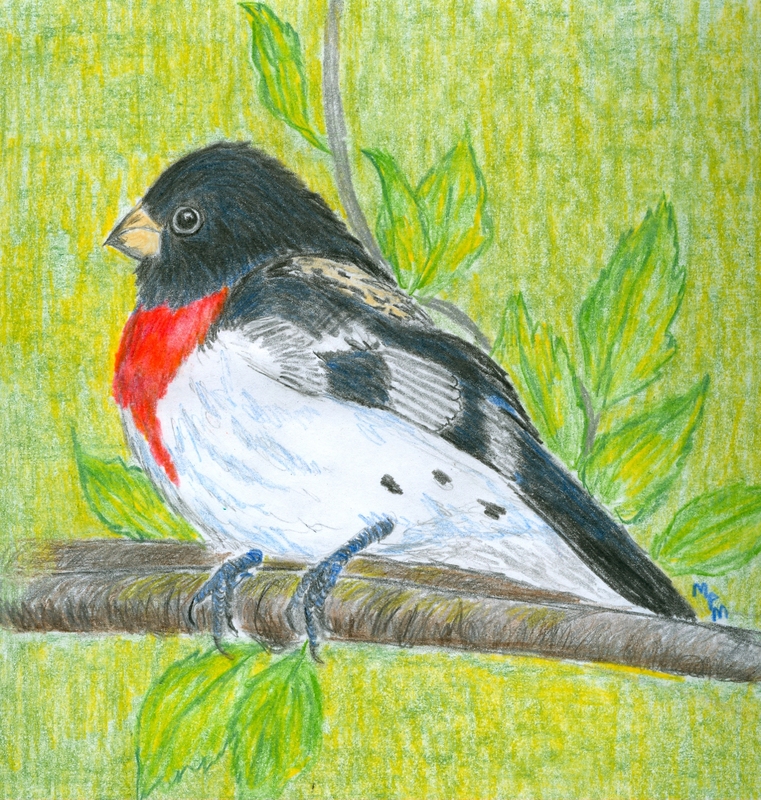 The two pictures above are my versions of two of those birds, the rose-breasted grosbeak and the gold finch. Wish I could do them justice. By the way, if you are ever in Williamsburg, Ontario do stop in at the Bed and Breakfast Tearoom and ask for the table by the picture window that looks out on their patio. Be prepared to indulge your eyes and your stomach. Bon appetit!